Ars Technica has a short article for HyperCard’s 25th Birthday. It was not the first thing I wrote software in – that honour goes to GW-BASIC, I think – but it was the first tool I made something useful and unprovoked in. I was eight or nine when I discovered it at school. It made it possible to realise what was in my head, not what was in a book. And it was the first thing that made designing the visual interactions of software easy for me. Software isn’t just arithmetic and lines of code – it’s something people use. HyperCard made sure that the visual end of software was usually the first part of a stack you made, not the last. (I was always disappointed that Visual Basic looked like it did this, but it didn’t quite live up to expectations). Look at XCode now, with its integrated Interface Builder; that’s one of the many legacies of HyperCard. It showed the average computer user (not the average programmer) that interaction and interface was important to great computing experiences, and gave them the tools to poke around. It is a tiny percentage of the reason I do what I do now, but a memorable one. I’ve been making a lot of things recently, both at work and at home. And as a result, I’ve been having to buy tools. Not a lot, but a steady trickle: discovering I need one of these, or one of those. A box of screws or bolts here; some wire there; a different kind of this to fit a particular need. I’m trying to artificially acquire odds and ends. This is hard. What, I think, I’ve been needing is a workshop. But you can’t buy a workshop. A workshop isn’t a set of tools in a room. It’s everything else, as well: offcuts; spares; old bits of wood; weird bits of plastic with strange holes in; broken things with one useful part to be cannibalised; hand-made jigs that fit particular things. There is no shelf in B&Q or Maplin marked “this, that, and the other“, and yet that – more than anything else – is what I’ve been needing recently. You can’t buy leftovers, spares, or “just the right thing”. And given that, I think a workshop isn’t measured in the volume of tools it contains, the number of shelves, or the lengths of its benches. I think it’s measured as a duration. A one-year workshop. A five-year workshop. A ten-year workshop. Ten years of making things, and ten years of all the entropy that goes along with that: spares, duplicates, improved versions of things, swarf, offcuts, and thingummys. And it’s a reminder why, when I visit my parents, I can almost always find the bits and bobs I need, or the right tool for a job, or a part I didn’t even know the name of – because there’s a thirty-year workshop waiting for me. "So, given this [zero-button, move and look] interface, whence interactivity in Dear Esther? I say: from an understated but deadly-precise sense of attention design through spatial design. You walk along the beach; a path goes up the bluff, another along the strand. You go one way or the other. There are no game-mechanics associated with the choice, and a plot-diagram analysis would call them "the same place" — you can try either, back up, and go the other way. But this misses the point. Precisely because the game lacks keys, switches, stars, and 1ups, it has no implicit mandate to explore every inch of territory. Instead, you want to move forward. Backtracking is dull. Worse: given the game's sedate walking pace, it's slightly frustrating. (They left out the run button for a reason, see?) Moving into new territory is always the best-rewarded move, and therefore your choice of path is a choice. You will not (unless you thrash hard against the game's intentions) see everything in your first run-through." Cracking writing about immersive, environmental storytelling in Dear Esther, and why it's clearly a game. "…he still remembers his frustration at encountering "sliced-up ghettos of thought" – sculpture, architecture, fashion, embroidery, metalwork, product and furniture design all in separate departments – "which I don't believe are absolute. It's just the way we categorise things and the way we chose to educate people."" Quite excited to see the Heatherwick show. "Super-simple baseline .mobi templates. Here ya go." It's basically a satellite that's an external Android peripheral, and they're chucking it into space with a phone attached. Impressive. "In publishing we now talk about immersive narrative, mainly because we are tense about the future of books. People who love reading are in it for exactly that: to soak themselves in story. To forget whenever possible that there even is a story outside the book, particularly the bubble-busting story of how the book was made. As a reader, I cling to the sense that this all but transcendent experience comes directly to me from one individual imagination. The feeling I have when reading fiction—of a single mind feeding me experience and sensation—is seldom articulated but incredibly powerful. As a reader, I don’t want fiction to be a group project." But, as the article points out, the role of the editor(s) means it always is. A lovely article about books, publishing and fiction. "Hazardously drinkable." Need to make this at some point. "As a programmer, we tend to take sysadmins for granted. The few times I've been without a good sysadmin have really made me appreciate what you guys do. When we're venturing into an environment without a sysadmin, what words of wisdom can you offer us?" A good list. 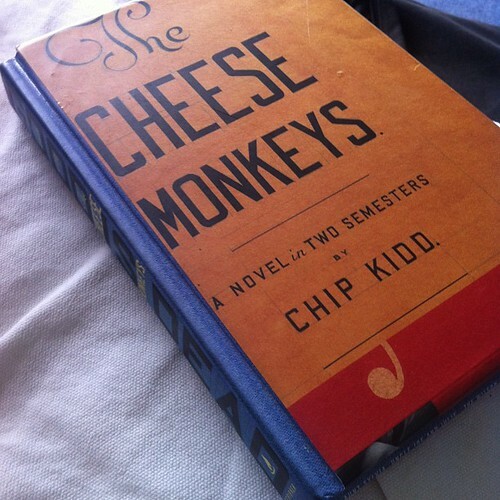 Chip Kidd’s first novel, The Cheese Monkeys, has been perhaps my favourite book of the year so far. Not the best book I read, but definitely my favourite. It’s about a young man attending art school in late 50s America, and discovering graphic design, through a particularly memorable course – Art 127, Introduction To Graphic Design, run by one Winter Sorbeck. I liked it for many reasons, including Kidd’s deft use of language, its acidic humour, and a description of being drunk – and then hungover – that comes close to Lucky Jim‘s. But I think I liked it most because it reminded me of the values of art school that I’ve come – very much secondhand – to appreciate. Namely: the value of the crit. More specifically: the value of disassembly – taking apart things you know and learning how to start from nothing. Taking apart a problem to find the only appropriate answer (though there may, in fact, be many). The value of being challenged to do difficult things, and honing skills. The value of physical skills – literal muscle control – in an era before the technological overhaul of design (and the value, as ever, of being able to draw. Even just trying to draw. It helps me a lot). And, most notably, the value of criticising the Work as the Work. In a crit, the work may be praised, it may be criticised, it may be torn into tiny pieces, fisked until there is nothing left of it. But it is only a criticism of the Work. It is not personal, and it only criticises the Worker in so much as it criticises their efforts and production on this work. It is a magic circle for being able to critically discuss a work. As Sorbeck’s students find, it is difficult to learn how to be in a crit, difficult to learn how to respond to one, and difficult to learn how to give one. But it’s all valuable: it is focused on making the work better. There is a degree of building a thicker skin about work required – but also a degree of understanding the difference between criticism and complaining, criticism and anger. I went to see Bauhaus: Art As Life at the Barbican last week, and The Cheese Monkey’s fictional version of the process of learning how to see was very relevant to my reading of that exhibition: seeing an institution begin to create the beginnings of what we now see in foundation art courses around the world. I was most glad to see the early output of the foundation years at the Bauhaus – some really exciting work made by artists learning how to see form, colour, material, and texture again. The Bauhaus reminded me of all the reason’s I enjoyed Kidd’s book. I could have dog-eared most of the second half of the book – classroom scenes and narrative alike – but there were three quotations I did end up marking, so as usual, time to share them on the blog. p. 106, in which Winter Sorbeck explains why the title of his course – Introduction To Graphic Design – has been retitle from the Introduction To Commercial Art that is listed in the course programme. p.177, Winter on design and power. It’s a lovely book. I had a lot of fun with it. "The problem with ideas ís, the idea is often simply a way to focus your interest in making a work. The work isn't necessarily, I think-a function of the work is not to express the idea…. The idea focuses your attention in a certain way that helps you to do the work." Variations of it in 'all clear' mode, and a 'battle mode', after the suit has suffered damage and new windows have popped up to show depleted weapon stores and hazardous environmentals and general. I start all designs on paper so I included some ideas for the dock icons. In the final icons, the more detailed versions show system status based on the way they animate." Lots of lovely detail in the work on all the fictional UI in the Avengers – looking forward to it being unpacked. "DAController is a wrapper class for use with the proCONTROLL joystick library written by Christian Riekoff for Processing. It encapsulates the two analog sticks and all the buttons found on a typical dual analog controller." Ooh. "We'll know we're doing it right when half of the pages are ugly."